Princess D’Annam Resort seems like a mirage, almost too good to be true after miles of empty, baking hot, windswept nothing. Ad Book now! Rates from US$302.4++. Average rating 8.6 from 446 reviews. Located 30 kilometres south of Phan Thiet, just south of Ke Ga Lighthouse, this sophisticated retreat pampers those with a padded wallet. In stark contrast to the big, impersonal resorts stacked up side by side in Mui Ne, this boutique resort is in the middle of nowhere and situated on a jaw-dropping white sand beach. With Ke Ga Lighthouse visible to the north and nothing to the south, this beach is for those looking to get away from it all. Opened in 2008, Princess D’Annam marries Indochine-chic with clean modern design. The cool white villas have sleek contemporary lines, the sharpness softened by ample flowering bushes, frangipani trees and artistic touches. Enter the rooms and you’ll be overcome with a sense of calmness and serenity – earthy hues and natural materials compliment the Zen furnishings. Your retreat includes creature comforts WiFi, air-con, desk, lounge area, private terrace, safety box, minibar, kettle, flatscreen TV, rain shower and huge tub. Sweep down the garden pathways, past the 48 villas, the pools (yes, plural) and the kids club and you’ll find yourself at the modern, breezy restaurant overlooking the infinity pool and the ocean. Find your spot on a lounger on the deck or underneath the postcard perfect palms that dot the sand. The menu looks delicious, a mix of upscale Western and Vietnamese dishes, but expect a hefty food bill. A beer alone costs 80,000 dong. Meals are what you would pay in the West and there is nowhere else to eat, except very local joints in tiny Ke Ga. And don’t forget about the spa treatments, the windsurfing lessons and the pretty bar that will tempt you to close your eyes and hand over your credit card. However, some money can be saved on the room rate. Check online – we noticed the standard room advertised for under US$140, well under the rack rate. Check rates at Princess D’Annam Resort & Spa on Booking.com. 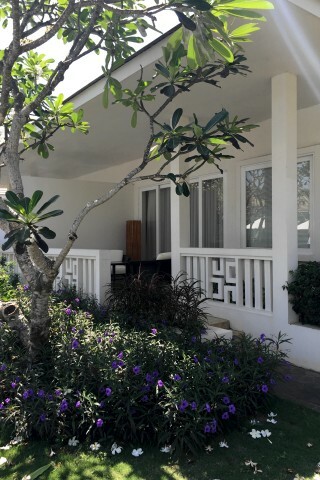 Room: Standard double room, low season: 5,400,000 dong, high season 5,400,000 dong. Notes: Mandarin Villa.